Last week, Hulu released a multitude of updates for their website the most notable of which is the adoption of a retrofitted video player. Hulu is a video-on-demand streaming website that allows users to stream content from networks like ABC, NBC and FOX amongst many others. From its debut in March 2007, Hulu has increasingly become the website of choice for many for catching up on missed TV episodes or to simply watch movies. The updates encompass a broad range of features, covering everything from improved audio, video, and user interface. To get a better understanding of the new and improved Hulu, let’s take a look at what all it can do. The most obvious modification is the Hulu video player, which now boasts a 720 x 404 pixel increase in standard viewing space, a 25% increase over the older player. At first glance, it might seem like simply increasing the viewing size would result in lower video quality; however, using new compression technology and adding an adaptive bit rate feature, the overall quality in the larger player is better than the old player. I’ll get into the workings of the adaptive bit rate later, but the thing to keep in mind is that the main idea is to allow users to stream higher quality content at faster speeds. To make the new player clutter-free, Hulu re-locating and even hid a few buttons. My favorite addition would have to be the new and completely clean default layout, which is void of any buttons. To access the menu items or to skip around on the timeline, all you have to do is hover the cursor over the player. With a larger size and well-spaced button lay out, the new player has a very nice, simple, and elegant look. A few buttons have been shifted around in the new lay out, mainly the full screen button, which is now at the lower left hand corner. The position is also a standardized location for all variations of the Hulu player. The overarching idea seems to be “the cleaner the better.” and, after using the new and improved layout, I would have to agree. Some of the other changes in the new player include closed captioning display options, a new seek preview feature, and the addition of the heat map. On the off-chance that I use subtitles, I sometimes find myself squinting to read the subtitles because they blend in with the background. The new video player now allows users to choose from yellow text instead of white text or white text over a black background for improved readability Next, we have the seek preview, which I found to be particularly useful. I remember the nightmare of a time I had trying to skip to a particular scene using the old player because it was impossible to know if I had overshot or undershot the scene. The new video player solves this problem by adding the seek-preview feature and the heat map. The seek preview feature allows users to now hover the mouse over the timeline and see a thumbnail picture corresponding to that particular point. However, I don’t always know the exact scene that I want to watch; this is where the heat map is useful. The heat map is a histogram of popular scenes of. The combination of nicer subtitles, the heat map and the visual time line features should allow users to accurately locate and watch particular scenes much more easily than the old video player. One of the more impressive additions to the new Hulu player is the adaptive bitrate streaming feature. While the old player only allowed a fixed streaming rate, the new player has the option of a fixed streaming rate as well as an “auto” option to maximize usability. The bandwidth in any given network tends to fluctuate over time. The main problem with choosing a high bit rate is that, as the bandwidth slows down for whatever reason, you experience increasing buffering times. Lowering the bit rate to compensate for the decrease in bandwidth sacrifices some quality for speed. The new adaptive bit rate feature’s “auto” option now ensures the optimum combination of quality and bit rate streaming, which in turn, ensures the smoothest video play back. All the new additions so far have improved the video part of the player, but, like I said, there is an audio component to it as well. The new ad volume normalization feature now modulates and minimizes the spike in volume that happens when an ad appears. The idea behind this feature is that the player analyzes the audio volume right before an ad is reached, and ensures that the volume doesn’t jump too high in comparison. While this feature doesn’t do a perfect job all the time, it is still a definite improvement. Another small new feature is ad tailoring. 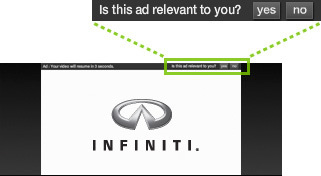 The new video player asks you whether the ad was relevant to you every time an ad plays. Simple yes or no answers are collected and used by Hulu to show more relevant ads in the future. Ad tailoring also pops up with an occasional survey. Users can either answer a single question and immediately return to their video, or answer a few questions in exchange for some ad-free video time. I personally would always take the latter option. I really didn’t find the ad tailoring to be that fascinating. Ads are ads in my book. However, with that being said, I guess as long as I’m forced to watch ads, I might as well be watching more relevant ads. The debate over Flash vs. HTML 5 has recently become a contentious one. While many people have their complaints about Flash, Hulu has decided to side with Flash over HTML 5 in their new player. According to Hulu, HTML 5 simply does not “meet all of our customers’ needs” at this point in time. One thing to note here and watch for is that HTML 5 will continue to grow, and, at some point, will have all the features that Flash does now. Steve Jobs, the CEO of Apple, has said that Flash is a dead technology, and if that is in fact the case, Hulu’s next video player might change over to HTML 5. Yet not everyone is pleased with the new Hulu features. A quick look through Google will show many dissatisfied and disappointed viewers. One of the major complaints is that the updates were rushed and full of bugs. Many users complained about constant crashes, browser compatibility issues, and, despite the adaptive bitrate streaming feature, more choppy viewing. While I didn’t have nearly as bad of an experience with the new player as some of the other people, I am still hoping that they will clean up the bugs in the near future. Ultimately, Hulu is still Hulu, and it is still my number one choice for streaming media. The updates introduce many promising new features like adaptive bitrate streaming and ad volume normalization. While these features might not work as well as we might hope, they are still big steps in the right direction. I personally took a liking to the new simple and clean layout of the player. Overall, provided that Hulu fixes the bugs that many users have been experiencing, this new video player is definitely a great improvement. The buttons and subtitles are so small with the new player that Hulu is now useless to me. The new player doesn’t scale the buttons, seek bar, or subtitles. At 1920×1080, you can’t have buttons that are 10 pixels tall. Especially on my interlaced display, that makes then equivalent to 5 pixels tall. I have figured out how to click the full screen button, but it only makes the video bigger, not the controls. I can make-out any of the other options, and I can’t seek through the video without a lot of luck in getting just the right spot. Back to torrents for me, I guess. Flash is just problematic. Hulu is working out those bugs. Hopefully soon. When the next version of flash rolls out with GPU acceleration support, that should help ease some of the load off the CPU. I’m eagerly waiting myself.